**Incredible Gulf & Bay Views** Golf cart!! 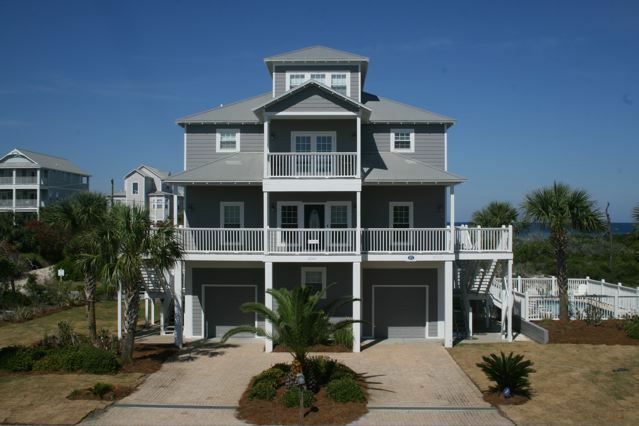 This beautiful, custom home is located in the new Seagrass neighborhood on Cape San Blas. Barefoot Escape has a private pool in addition to the community pool and club house. Perfect for a large family or multiple families, this home has 4 separate living areas. The ground level has a living area with a futon, sleeping chair, TV, and large bath. The entry level has a king bedroom and a second bedroom with twin bunks and a twin captains bed; BOTH WITH GULF VIEWS AND PRIVATE BATHS! The main floor has a spacious living and dining area open to the kitchen. This area also has a gulf view and a queen sleeper sofa. Also on this main level is another large king bedroom with a bath. The top level has a day bed with a trundle and a nice lounging area. This room has a beautiful beach mural. All levels have TVs, access to outdoor deck or screened space and breathtaking views. There is also a twin rollaway to sleep one more! For entertainment there is something for everyone: a golf cart for convenience (& fun), ping-pong, boogie boards, skim board, fishing supplies, sand toys, floats, bikes, and kayaks! 6 chairs at table and 6 bar stools at kitchen bar. Additional table and chairs for six on screened porch off main level. Three balconies on gulf side, two on bay side. Screened porch on gulf side. Hammock swing off one master. Across the street and two lots down. We've stayed at Barefoot Escape many times over the past years and are never disappointed! The ocean views from both balconies are breathtaking and we love the convenience of having a pool at the house. Every kitchen need we have is thought of and the eating and sitting areas are comfortable even for multiple families. We had to skip our time last year but never again! we consider it 'our' beach home!!! You will fall in love with Barefoot Escape! My family had the pleasure of staying at the well equipped Barefoot Escape. This home has it all, a view of the sun setting into the water, your own private pool, downstairs recreation space including a ping pong table. It had unlimited deck space, one that is screened in and covered, perfect for outdoor dining. If you are tired from the fun and sun, you can shower in the hot and cold water outdoor shower and then you can relax by watching the numerous TV’s. This home is in a subdivision where you feel safe for you children to ride the provided bikes. We loved that Cape San Blas is less commercial than than many beach communities, a slower pace (if you have bikes, skates, skateboards, bring them, there are miles of safe paved paths). In a very short drive you can be in Port St. Joe where there is a grocery store, quaint shops, golf and many different types of dining! Visit Barefoot Escape, you want be sorry! We have rented this property for 7 years running for our summer vacation. I cannot say enough good things about this place! The beach and water are always beautiful. The house is great for kids or big adult groups and fits a variety of needs. Barefoot escape really has it all! The park at the end of the cape is a must see. Kayaking and fishing in the gulf or the bay never disappoints! The beach is a short walk and is clean and quite. It's also a short drive to some great seafood! If you like to visit small coastal towns Apalachicola is a great day trip and a short drive. To top it all off the owners are some of the best people we have ever met! Why would we go anywhere else?! We have been staying here every summer for the past 6 years! We absolutely love it! The beach and water are always beautiful. The house is great for kids, families, or big adult groups. The house is very well stocked! It is very spacious and always very clean! The beach is a very short walk and is clean. This house also has a pool! Great for hanging around day and night! It's also a short drive to some great seafood as well as other types of food! Apalachicola is a short drive and makes for something else fun to see/do. It's a cute coastal town with cute shops and restaurants. If the house wasn't enough, the owners are the best! So very nice and super helpful. Would definitely recommend this place!!!! Just beautiful - we can't wait to return! This is a fabulous home - a great location with lovely views of the sunset and gulf from the balconies. The kitchen is large and very clean and modern. My family of nine had plenty of room... The private pool was crystal clear. The area was secluded, but at the same time only a bike ride to the general store for ice cream. The house is situated on a loop away from the main thoroughfare and I felt safe letting my kids explore. Overall the house was bright and airy and open, and that was so refreshing. This home had ping-pong and Foosball... a golf cart and kayaks and boogie boards... We set up a sun shade on the beach and left it there all week - it felt like a private beach most of the time. My kids fished and kayaked in the surf, the ocean, and the bay. We also hunted for scallops and crabbed, and went for an evening to Apalachicola for oysters. It was just perfect and we hope to return! Perfect weather, clear water. House slept our 10 very comfortably! Large kitchen with long bar, table for six, and outdoor table for six made it easy to eat together. Kayaks and beach toys were a huge plus! Everything was very clean well equipped. This house also has a bay view. Scalloping in the bay is great fun!